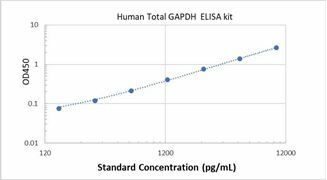 Specificity This assay has high sensitivity and excellent specificity for Human Total GAPDH. No significant cross-reactivity or Human Total GAPDH and analogues was observed. 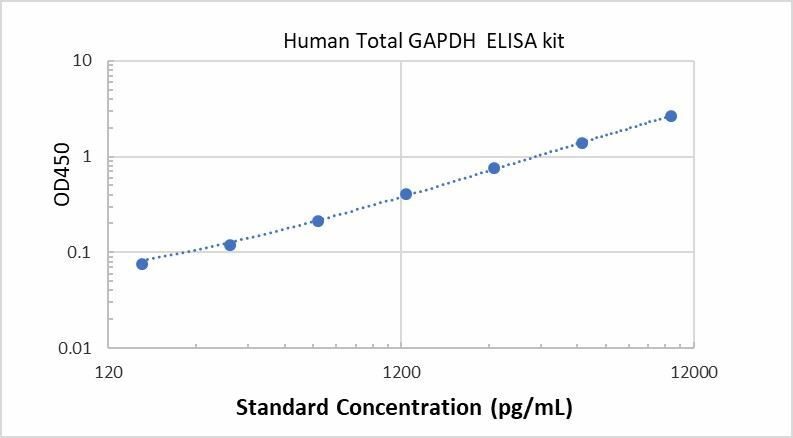 Typical Data ELISA: Human Total GAPDH ELISA Kit (Colorimetric) These standard curves are provided for demonstration only. A standard curve should be generated for each set of samples assayed. Background Glyceraldehyde 3-phosphate dehydrogenase (abbreviated as GAPDH or less commonly as G3PDH) is an enzyme of ~37kDa that catalyzes the sixth step of glycolysis and thus serves to break down glucose for energy and carbon molecules. In addition to this long established metabolic function, GAPDH has recently been implicated in several non-metabolic processes, including transcription activation, initiation of apoptosis, ER to Golgi vesicle shuttling, and fast axonal, or axoplasmic transport. In sperm, a testis-specific isoenzyme GAPDHS is expressed.